Offering both boys’ and girls’ lacrosse teams and developmental programs year-round, Houlagan Lacrosse is based out of Dover, NH and strives to offer an educational opportunity for student athletes in NH, Maine, and Massachusetts. The partnership between the two organizations will include relocating the Houlagan Lacrosse central operation to Seacoast United’s Epping (NH) Sports Complex beginning late spring of 2018 for their summer lacrosse programs and outdoor games. Houlagan’s indoor programs will utilize both the SUSC Epping Indoor Facility and SUSC Indoor Arena in Hampton. 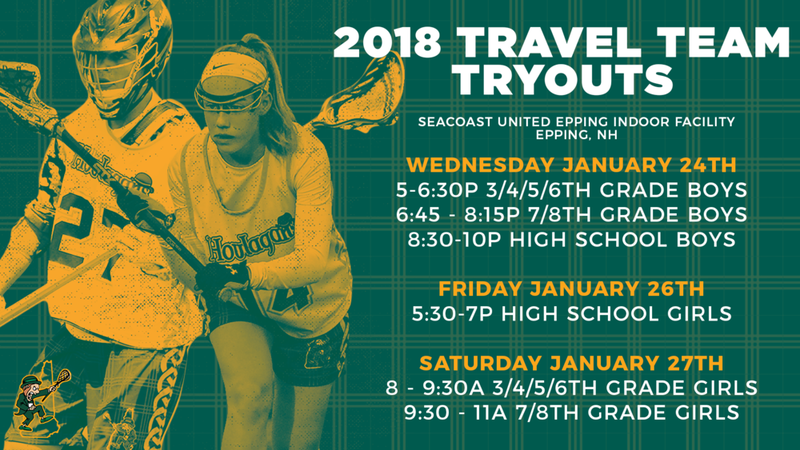 Come experience Houlagan Lacrosse at the new SUSC Epping Sports Complex for their 2018 Travel Team Tryouts on January 24th – 27th. These exclusive tryouts are open to all boys and girls in grades 3-12 only on these select dates. Tryouts are for a limited number of spots for both elite and developmental teams, catering to players of all levels. Houlagan Lacrosse has the best coaching staff in the state and have the track record of being the best developmental program around. Tell your friends about tryouts! Houlagan Lacrosse is the premier club lacrosse program on the Seacoast. Our program allows players, with the interest and passion, to play lacrosse year round and develop their skills through clinics, leagues and tournament play. We offer several different levels of participation throughout the year. Houlagan Lacrosse is a family operated business where we consider each member of our club as an extended member of our family. Learn more at www.houlaganlacrosse.com.